TJSB sahakari Bank Maharashtra (TJSB sahakari Bank Ltd), Thane published a new job notification for Trainee Officer Posts. The willing candidates are informed to see the latest notification March 2019. Qualification required Graduate in any stream from a Recognized University. Last Date of Online application is 05-04-2019. 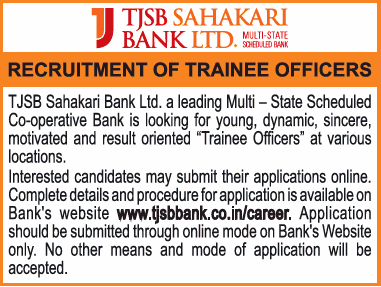 For More details of TJSB sahakari Bank Maharashtra Recruitment 2019 Read Below. Education Qualification: Graduate in any stream from a Recognized University. Age Limit: Above 20 years – below 27 years. i.e. Candidates born after 01.04.1992 but before 31.03.1999 are eligible (Inclusive of Both dates). Interested & Eligible candidates can apply Online through the website www.tjsbbank.co.in earlier than the due date. Application starts Online 25-03-2019. Last Date of application is 05-04-2019.